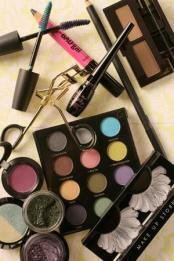 Guest Post: Make-Up: Modern Muslimah Dilemma? It seems women worldwide are no longer content with their natural looks and the beauty they have been blessed with to the extent that shopping malls and high street shops are conveniently filled with women after the next ‘must-have’ product. I don’t think that our gullible attitude to the product marketing within the cosmetic industry is the only thing to be blamed, rather I feel that it is the unruly and quite cunningly subtle advertising which has led to even the modern Muslimah’s dilemma in being consumers of the cosmetic world. I for one live with 3 sisters, all who have their average share of make-up so I’m not against it’s use rather what worries me is that young Muslim girls now feel they can’t go out without their ‘face on’. Any girl will tell you, it’s nice to try out different make-up and provided it’s used in the purposes of beautifying ourselves in the presence of family and friends, what harm is there some may say? Sadly, many of the simple lessons of understanding that indeed Allah loves for us to take care of ourselves have been misconstrued to qualify huge amounts of spending on looking good. So the modern Muslimah indulges in the odd make up item, don’t get me wrong – even I have bought the odd few which were out of my usual range but the question to ask is are we letting our sisters fall into this dilemma of buying the latest MaxFactor product and the astonishingly beautiful Lo’real make-up because they don’t feel beautiful in their skins already? Perhaps what we can learn from this is that we’re not all safe from the big corporate world of cosmetic fantasy but rather we should guard ourselves against falling into the dilemma which leads to lack of self-satisfaction with our looks through the make-up mania out there..
Would love to hear your thoughts on this, are Muslim women becoming too indugent in cosmetics or are we innocent? Is it HARAAM to take care of the skin(even facial skin) all together?I believe that basic skin care should be fine,not any make up-but the cleanser-Toner-Moisturiser to protect the skin,and usual kajal(eye-pencil) should not be considered as "excessive make up".Would love to know the limits...May ALLAH help us to better ourselves,Ameen. Asalaamu aleykum sister Shareen, one of the biggest misconceptions is that kohl( eye liner) is sunnah for both sisters and brothers. But the reality is that kohl is sunnah for brothers only. Therefore, it is not allowed for a sister to wear eye-liner in front of her non-mahrams. I hope that clarifies the issue for you a little. there is nothing wrong in using cleanser-Toner-Moisturiser to protect the skin.We can use makeups to beauty ourselves for our husbands.Also havent heard anything wrong if we are doing it for ladies only party.this is from my limited knowledge...the point is we should be obsessed with these kinda things since our focus should be on something greater which if the pleasure of Allah swt..
type: I meant we should NOt be obsessed with these..